The CoolBot transforms any well-insulated room into a walk-in cooler by harnessing the cooling power of a standard air conditioner. An amazing product that will allow you to keep a cool room at the temperature you want ... to store you garden bounty, or for a cheese cave... and many other uses! Results vary depending on the outside environment, the size of the insulated room and the size of the air conditioning unit, but as a general guide, an 18,000 BTU window A/C unit keeps produce in a 7-foot-by-12-foot insulated room at 38 degrees during the summer with plenty of cooling power to spare. And we are also offering you a free gift when you purchase the CoolBot from us. Just check one of the free gift options when adding it to your cart! Choose from one of our Pickle-Pro Fermenting Lids, or LyoPro YD + (Bulgarian) Yogurt Culture. Who can benefit from this new CoolBot technology? 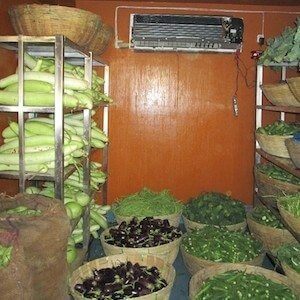 Homesteaders, CSAs and Farms can build affordable walk-in cooler used to store inventory at refrigerated temperatures in any climate preserving your fruit or vegetable production much longer. 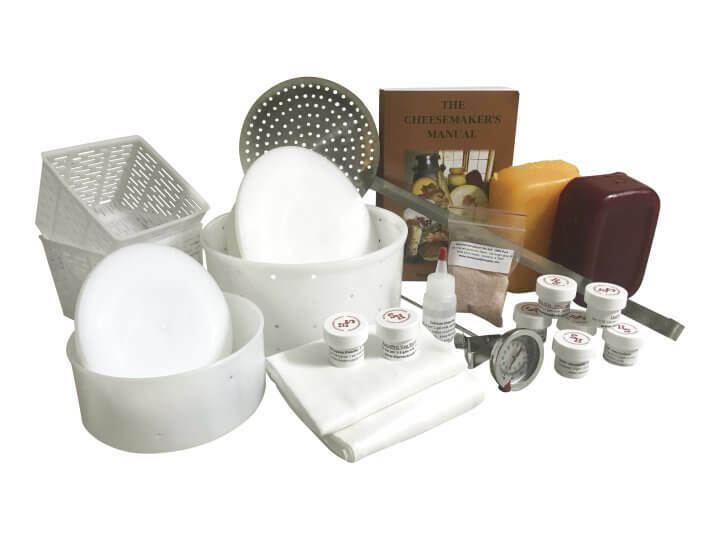 Dairies, Creameries and Individual Cheese Makers can create cheese caves with total temperature, humidity and air circulation control. 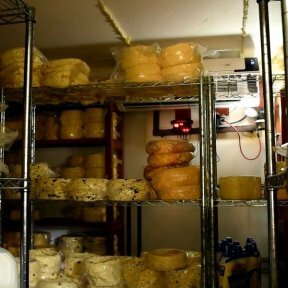 Check out the Cheese Cave Video Below! 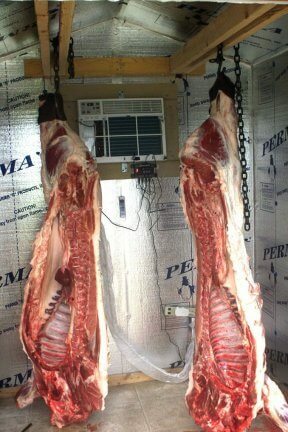 Hunters can quickly cool harvested game to a safe storage temperature is critical to avoiding meat spoilage. Bars and Breweries can easily build affordable walk-in cooler for your brewery for fermenting, lagering, or just keeping your brews cold fro drinking. Restaurants use CoolBot-driven coolers as both their primary walk-in coolers or as back up or secondary storage saving on lower upfront costs and smaller monthly electricity bills compared to traditional compressor systems..
Click on photo above to view additional photos! Click on additioanl info below to see how to Set up a Walk In Cheese Cave with a Cool Bot, or the other one How to set up walk in cold storage for your farm. Traditional walk-in cooler refrigeration systems sell for $2,500 plus installation (which can be another $2,000 with electrical setup). Traditional systems use a “brute-force” approach to cooling: lots of coolant (which is bad for the environment), a big motor, a large surface area, and multiple fans (which can dry out your vegetables and account for up to 60% of the cost of operating electricity). 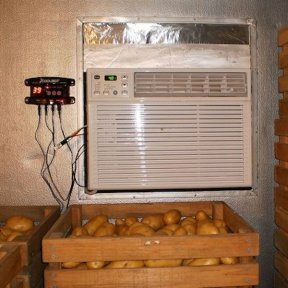 Here’s the crazy thing: That $2,500+ walk-in cooler compressor you see on a small 8′ x 8′ vegetable cooler may only put out 8,500 BTUs of cooling power! That’s less BTUs than you get from a $300 window air conditioner from Home Depot! Why not just use an A/C unit? First, they are electronically limited so that they can’t go below 60° F. With some electrical bravery and skill, you could snip, solder and bypass the electrical controls so you could go lower. It will work better, but still not very well as your ability to actually utilize that cooling power drops drastically as you approach 60° F. This limitation at 60° F vs. a traditional walk-in cooler refrigeration system is driven by the lack of extra fans and surface area built into traditional walk-in cooler compressor / condenser / evaporator units which dissipate the cold without freezing up the fins of the unit. The CoolBot’s patented technology intelligently controls your air conditioner – so you can harness its cooling power and keep temperatures in the 30s without freezing up your air conditioner. How does the CoolBot work? The CoolBot uses multiple sensors, a heating element and a programmed micro-controller to direct your air conditioner’s compressor to operate in a such a way to cool the room to 36° F without ever freezing up. 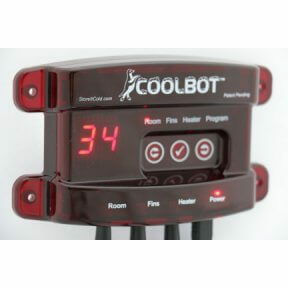 Additionally, our innovative interface which links the CoolBot controller to your air conditioner allows for 5 minute installations without any training, cutting, soldering or even taping. CoolBot cannot give you 100% use of the listed BTUs on your air conditioner, so you will need to buy a higher BTU air conditioner than the BTU size you would buy on a traditional cooler compressor. However, the price of a larger air conditioner and a CoolBot is a fraction of the cost of a real walk-in cooler compressor, saving you $1,000s in upfront equipment costs. Most importantly, when the CoolBot begins to lose efficiency when accessing your BTUs of cooling power (when the air conditioner is close to freezing), it is programmed to shut off the compressor on your A/C unit, so you do not pay for electricity to make BTUs that you can’t use! That saves you money on your monthly electricity bill and helps the environment. As long as you sized your air conditioner correctly and insulate your cooler well, you’ll have no problem keeping your room as cold as you want it to be.